The San Francisco Marathon is a loop course and Haskella��s home race, too. 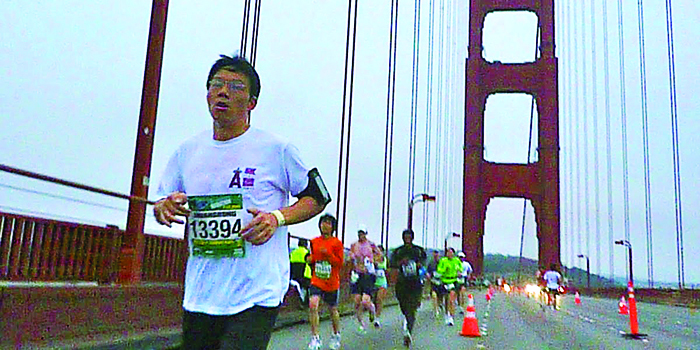 The race starts and finishes at the marina, so running across the roadbed of the Golden Gate Bridge, through the Presidio and into Golden Gate Park is a great highlight for first-timers, wea��re told. Also, if you do this one well, you could automatically qualify for the popular Boston Marathon. Whether youa��re on a runnera��s high or just want to give the 2014 Beijing marathon a go to support a cause and donate to charity, Haskell says this one is a favourite as he clocked his personal best here. The race follows an undulating, urban route starting at the infamous Tiananmen Square, past the Forbidden City and the Olympic Village before ending at the Birda��s Nest stadiumA�a��the national stadium. The ardent runner puts this one on the list primarily because it is considered the worlda��s largest marathon, apart from being the first one he ever ran. The 44-year-old race that took place on November 2 brought together various cultures and people from across the globe and they ran through the five boroughs of New York City: Staten Island, Brooklyn, Queens, the Bronx, and Manhattan. A tourist event, we say. AnA� unusual race, Haskell tells us it is a different high to actually traverse the historic Great Wall in this marathon. A rather rigorous route, set atop the actual wall which traces many a valley and mountain, this race also has 5,000 steps to cover. Apparently quite demanding,A� so better not try this one as a beginner.A� a�?But the dramatic landscape, lush scenery and the feeling of racing on a historical monument, makes it that much more appealing and interesting,a�? shares Haskell, adding that he now understands why Genghis Khan decided to go around the wall rather than on it.